Crawley Town midfielder Mike Jones is glad to have finally scored his first goal for the League One club. The 25-year-old opened his account in Tuesday's 1-0 victory over Preston North End, in what was his 45th appearance for the Reds. He told BBC Sussex: "I'm more relieved than anything. I can't believe it's taken so long. "It's been a frustrating season with hitting the woodwork, close shaves and times when I should have done better." He added: "That's football and you've got to keep going. "I knew it would come in the end. It is a wasted season - I wish it was a bit longer so I could kick on. "I am feeling fit and at times like this you play with more confidence and feel that you can do a lot more. "I feel like I am finishing the season strongly and hopefully I can come back next season more confident." 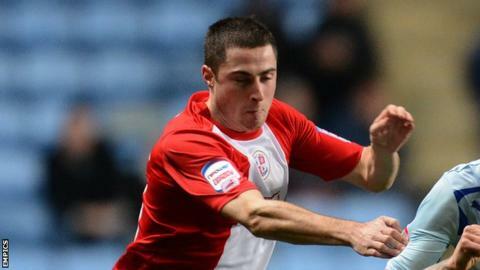 Jones, who moved to the Broadfield Stadium in August, played under Reds boss Richie Barker at his previous club Bury. Baker was equally pleased to see Jones finally get off the mark. "Against Preston I thought he was fantastic and hardly gave the ball away," Barker told BBC Sussex. "He sees things that other people don't see. "We did something a little bit different and I thought it suited Michael pretty well. "I brought him in because I thought he could score goals - he did for me when I was at Bury. "The players were delighted for him as well as they know how hard he works in training and how much it meant to him to get his first goal." The win over Preston puts Crawley tenth in League One and guarantees them a top-half finish in what is their first campaign in the third tier. "We're just going to miss out [on the play-offs] and it is a disappointment but Crawley's first year in League One has to be looked upon as a successful season," Jones added. "There are some big clubs in this league and we have got young players. "Hopefully next year we can go one better."